In Year 9 English classes do Literature Circles with the following titles — and some students have asked about ebook and audio book versions. Due to digital rights management, the library has limited options when it comes to providing ebooks and audiobooks for loan. 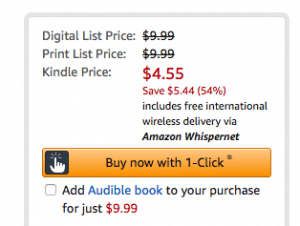 But if you are interested, there are ebook with accompanying audio versions by Audible available via Amazon — a feature they call “Whispersync” — which you can purchase for your personal devices. Links are provided below for all titles, except “Reclaimed” by Sarah Guillory. For that book there is no digital version available anywhere. On Amazon, there is a Kindle ebook version with Whispersync feature available (Amazon store link) for US$23 – (ebook = US$6 + Audible narration = US$17). NB: The link above works for a Thai-based Amazon account, but if you are logged into a US-based Amazon account, it says that is not available. 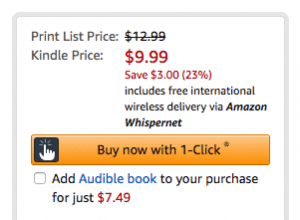 Instead, this option is available in the US store — (US$10 for the book plus US$7.50 for the Audible book). On Amazon, there is an ebook available for US$9 (Amazon store link). On Amazon there is a dramatised audio book version available for US$18 (Amazon store link). NB: This audio book is not linked to the ebook. In the library, there is no audiobook available right now, but we have ordered a Playaway (physical device with MP3 version) from Follett Titlewave for the library general collection. It should arrive by December. On Amazon, there is a Kindle ebook version with Whispersync feature available (Amazon store link) for US$20 (ebook = US$9 + Audible narration = US$11). This book is the young readers edition of “The Art of Racing in the Rain” – so slightly shorter than the original. On Amazon, there is a Kindle ebook version with Whispersync feature available (Amazon store link) for US$17 – (ebook = US$10 + Audible narration = US$6.60). On Amazon, there is a Kindle ebook version with Whispersync feature available (Amazon store link) for US$21 – (ebook = US$9 + Audible narration = US$13). On Amazon, there is a Kindle ebook version with Whispersync feature available (Amazon store link) for US$17 (ebook = US$10 + Audible narration = US$6.60). 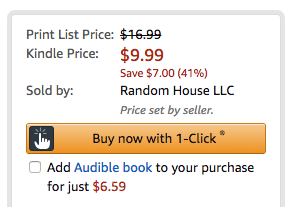 NB: This Audible option does not seem to be available in Amazon when logged in with a Thai address, but you could buy it using an US Amazon Gift card. The screenshot on the left is what is shown when logged into a US-address-based Amazon account. The library has ordered a “Playaway” (physical MP3 audio version) for “Wonder”, but it won’t be available for sale until November 1st and then we must wait for it to be shipped here from the U.S.
On Amazon, there is a Kindle ebook version with Whispersync feature available (Amazon store link) (ebook = US$4.55 + Audible narration = US$9.99). On Amazon, there is a Kindle ebook version with Whispersync feature available (Amazon store link) (ebook = US$9.99+ Audible narration = US$7.49). Share book reviews and ratings with Secondary Library, and even join a book club on Goodreads.